ROME (Reuters) - Italian scientists say they have proved Napoleon was not poisoned, scotching the legend the French emperor was murdered by his British jailors. Napoleon's post-mortem said he died of stomach cancer aged 51, but the theory he was assassinated to prevent any return to power has gained credence in recent decades as some studies indicated his body contained a high level of the poison arsenic. Napoleon I was a great general and statesman. It was, too, a passionate man who wrote beatiful love letters to the woman he loved so passionately, Josephine, his first wife. It seems that Napoleon I was the most important man of the French Revolution. That says an american historian, specialized in the 18th century: "In one great explosion everything changed. A man made the difference: Napoleon. Without him the chaotic revolution would have imploded from its contradictions." His first wife did not love him at the beginning of their marriage, but she did later, when he stopped being so crazy about her, even he loved her till the end. They were a very well combined couple in the social theme, since she had all the emotional intelligence he lacked, she was the public relations specialist in the couple. His second wife never loved him. She was already in love with someone else when the state marriage was arranged. They had a son, whom she never cared about too much, and as soon as she could she married the man she really loved. Interesting article . . . well cut out the poisoning conspiracy rumors. And as for Napoleon's wives, I always had the impression that his marriage to Josephine was much better that his marriage to Marie-Louise . . . the latter marriage was basically arranged to get Austria off Napoleon's back (for a while at least). You are right, Jason Maier, the first one was his real marriage, even they did not have children. She already had two children by her first marriage, whom Napoleon loved and cared about dearly. The first marriage was arranged, too, by Barras, who wanted to get rid of his mistress Josephine de Beauharnais and to have under control the new military genius. But Napoleon fell in love deeply and inmediately, like striken by a ray. She was empress for five years, before the divorce caused by dynastic succession problems, but the marriage lasted 15 or 16 years, and he continued protecting her after the divorce. She lived like a queen and spent money lile a movie star of nowadays. Stanley Weintraub says, reviewing the book by Olivier Bernier, that we seem always to exist in a dynamic of unintended consequences, because even after the Corsican was stopped "there was no stopping the revolution", the genie could not be put back in the bottle. The world of the 19th century was a new order, and no one, in 1800, could have predicted any of this. And that is happening again in the aeternal return that Nietzche wrote about, this time in the United States. Josephine in the beginning didn't care that much of Napoleon, indeed arranged by Barras and the marriage provided her with (financial) security. Napoleon was in love, though Josephine cheated on him while he was on his militairy campaigns in Italy. Slowly the tables turned, Josephine was the one desperate for Napoleons attention (I am not sure how much that was for her actual affection of Napoleon and how much of it was to secure her position) while Napoleon started looking elsewhere. He was rather pleased with empress Marie-Louise for example, but he had other mistresses before. The name of the Empress Josephine when she was born was Rose Tascher de la Pagerie, then de Beauharnais by her first marriage. Josephine was the name Napoleon chose for her, the one that he thought fitted her. She was a very beautiful and charming lady, smart enough for learning throughout her life, all kind of things that could be practical and useful, but did not have the heart of a real queen. She was not worried about the people or humankind, as a real queen should be. She was born in the french caribbean, in the Martinique isle, where her family had slaves. Slavery had been already abolished by the Convention when Napoleon repositioned it for the french colonies. Napoleon III, Rose Tascher´s grandson, gave an statue of her grandmother to the isle, which is regularly beheaded. The name of the Empress Josephine when she was born was Rose Tascher de la Pagerie, then de Beauharnais by her first marriage. Josephine was the name Napoleon chose for her, the one that he thought fitted her. Josephine was Marie Joséphe Rose Tascher de la Pagerie - so Josephine (little Joséphe) was a variation of her real name, not one invented. IIRC she chose it when she came to France to marry. 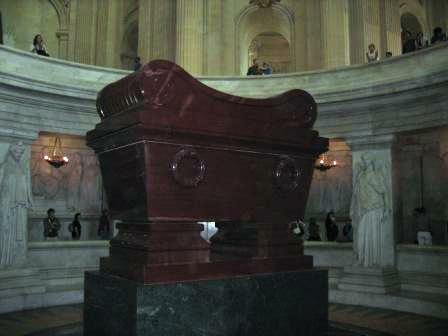 Napoléon I le Grand Empereur,tomb at the Dôme des Invalides,Paris. Are you sure about that? I read that it was Napoleon who started using Josephine instead of Rose, as he found Rose too common (just as he changed the name of Desiree Clary I believe). It seems that Empress Josephine had very bad teeth and her smile, hiding them, became famous. She was 6 or 7 years older than the Emperor. As soon as they got married, he left to fight the Italy campaign and she stayed in Paris, where very soon she took as a lover a young and good-looking man, Hyppolite Charles, an officer. I have not found images of him. The Emperor begged her to join him in some famous very passionate letters that she never answered. Her mind and time were busy. When the politicians finally sent her to join the general, she took Hyppolite Charles with her in the trip. Both Napoleon and her son thought she was a sweet lady. I think she was a person with the gift of a natural high grade of emotional intelligence that she used successfully to strive in life. I recall having read that in more than one biographies that she changed her name herself after she had survived the revolution - as a celebration of life. But maybe Napoleon already was part of her life and influenced her? I must confess I never checked it, but it seemed to fit in with her character. last but they still had a close friendship in her latter years. "I have felt sad ever since leaving you," he wrote her on July 17, 1796. "All my happiness is in being near you. I keep remembering, over and over, your kisses, your tears, your charming jealousy; and the beauties of the incomparable Joséphine constantly light a bright and burning flame in my heart and in my desire.... A few days ago, I thought that I loved you: but, since seeing you, I have felt that I love you a thousand times more still!.... Ah! I beg you, let me see a few of your faults; be less beautiful, less graceful, less kind above all." "I have not had a letter from you for two days.... Why, you wicked, ugly, tyrannical, pretty little monster! You laugh at my menaces, at my silliness. Ah! if only I could lock you up in my heart ... I would keep you imprisoned there." Your letters are as cold as if you were fifty," he told her on October 17, "they look like a fifteen year old marriage. One sees there friendship and the other feelings of that winter of life. What, Joséphine! That is very cruel, very wicked, very treacherous of you! What more can you do to make me thoroughly miserable? Stop loving me? But you've already done that. Start hating me? Well, I wish you would, everything is humiliating except hatred; but Indifference, with its steady pulse, its unwavering eye, its monotonous pace! ... A thousand, thousand kisses as loving as my heart." I don't love you at all any more; on the contrary, I hate you. You are wicked, clumsy, stupid and plain. You never write me, you don't love your husband." Marie Joséphe Rose Tascher de la Pagerie was Josephine's correct name and she was know as Rose de Beauharnaise when she was married to general Alexandre de Beauharnaise. Napoleon gave her the name Josephine and motivation was: Rose had been the mistress of many influential men but nobody but him had slept with Josephine. Source: Herman Lindqvist Napoleon. Desiree Clay's full name was Eugenie Bernadine Desiree and she was called Eugenie in the family. She herself did not like that name and when Napoleon broke up with her, she decided to change her name to Desiree to make a clean break with the past. I look for info about other legitimate children of Napoleon, brethren of Napoleon II. Josephine was kind of the epitome of the sophisticated older woman, and Marie Louise was the epitome of the young inexperienced virgin ( at the time of her marriage). Napoleon undoubtedly cared more for Josephine and had he not had to have a heir, would have stayed married to her. They only divorced for dynastic reasons, although certainly each cheated on the other, but they loved one another. Marie Louise was a typical Hapsburg and they were accustomed to marriages for dynastic reasons, but still it must have been hard to marry the man who had taken over the throne of her relatives ( she was MA's niece), although Napoleon hadn't started the revolution. I have read about how Napoleon was banished to an isolated island for his crimes. I am not sure if he really had any to speak of though. I have often wondered if it was really the catholic church tring to get back at him for his push against the hard line of the catholic church. Then again am I wrong in this interpretation? The memories of Nepoleon are still seen in the Americas to this day with the government of Louisanna and Quebec still having many of his ideas in place to this day. Although his one mistake of conquering lands and selling them to support the gouernment was not to smart. However leaving a mark on history and being a great leader does not mean that every decision has to be exactly perfect. Napoleon was sent into exile twice:- first to Elba 1814-1815, he came back, was defeated at Waterloo, and sent to St Helena 1815-1821 where he died there. Twice, it was a coalition of various governments whose armies had defeated him in battle, that led to his banishment, nothing to do with the church.